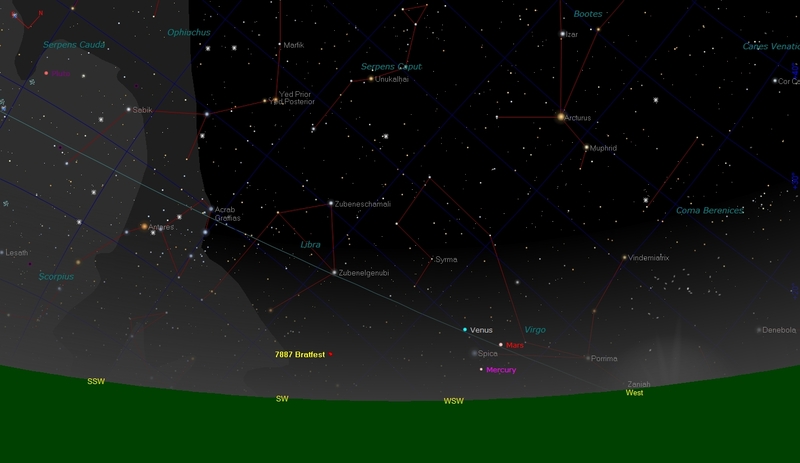 Asteroid (7887) Bratfest on the night of 2008 Sep 20, as seen from Boulder, Colorado, at 19:15 MDT, about 15 minutes after sunset. Bratfest will set at 19:52 local time. It is V magnitude 17.8 and 3.46 AU from Earth. Note the nearby clustering of Mars (V=1.7), Mercury (V=0.6), Venus (V=-3.9), and bright star Spica (V=1.0) all near the western horizon just after sunset. The view of all of these objects may be blocked by the mountians to the west.